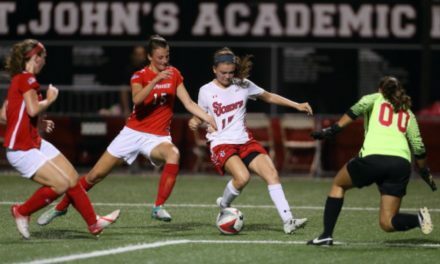 QUEENS, N.Y. – The St. John’s University women played Providence to a scoreless tie Thursday evening at Belson Stadium for the Johnnies first extra time draw of the 2018 campaign. After earning a spot on the Big East Weekly Honor Roll for her performance last week, goalkeeper Meredith Reinhardt was flawless. The Scottsdale, Ariz., native tied a season-high six saves, recording her second shutout of the season. The Red Storm will return to action Sunday at 1 p.m., welcoming Butler University to Belson Stadium for Senior Day.